A healing seashore atmosphere, two new yoga studios, professional massage therapists, and fresh local food markets in most of its seven villages are allowing vacationing guests to escape the hustle and bustle of their urban and suburban lives and nourish their mind and body on island time. “The island has a very calm, relaxed energy. Our clean air and water, bright, starry skies and vibrant sunsets set us apart from other commercial wellness resorts.” explains Cena Jennette, who returned to her native Hatteras to raise a family after years living, and teaching yoga in cities all over the East Coast and California. She opened Hatteras Yoga Studio in 2015 and has been overwhelmed by support from both the local yoga community and visiting yogis from all over the world. Vacationers don’t just stumble upon the studio while they’re here; they get away with the intention of practicing; bringing with them their favorite yoga mats, open minds and infectious energy. The influx of health-focused visitors allows for international guest instructors at the studio, who in-turn energize the local community. One of Hatteras Yoga’s most popular offerings is private yoga sessions on the beach or in a guest’s private vacation home. “They’re a great way to celebrate upcoming weddings, milestone birthdays or to just spend time really connecting with loved ones in a peaceful place.”, said Jennette. 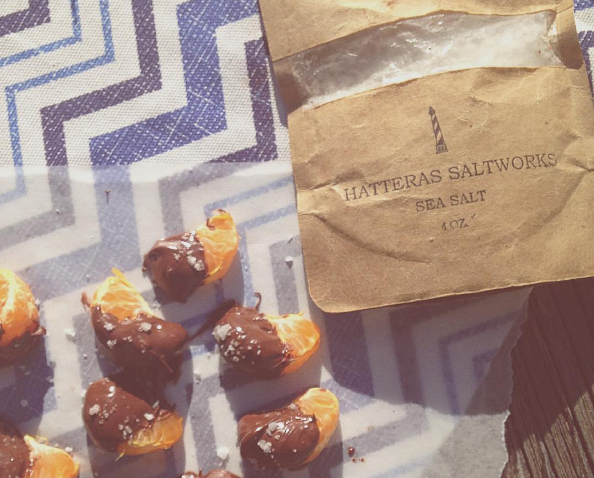 Another newly forged business on the island, Hatteras Saltworks, creates local sea salt by gathering clean, nutrient-dense sea water at the intersection of the Labrador and Gulf Stream currents just offshore. While most sea salt manufacturers bake or boil their water, Hatteras Saltworks’ unique solar evaporation technique may take over 45 days, but it allows for optimal nutrient retention. The result is a soft, flakey product. “Clean air, solitude, salt water everywhere — and a natural beauty that can only be found on an isolated sand bar…” are all reasons to appreciate life on Hatteras Island, according to Hatteras Saltworks co-owner and operator Brian McMahon. There’s something nourishing about eating food raised in the wild, and local seafood markets are the place to get just that. A true family affair, Harbor House Seafood Market in Hatteras is run by Vicki Harrison and her husband Robert. Their passion for seafood and the culinary arts is evidenced in the carefully prepared meals and sides you can purchase alongside the local fresh-caught seafood in their market. Their children Graham and Alana both work in the market preparing food, helping customers and fishing inshore and offshore to provide the store’s inventory. If you don’t know how to cook something, don’t worry, just ask Vicki. She will describe preparation in such mouth-watering detail, you’ll rush out with your stomach rumbling (if that hasn’t already happened from the rich smell of crab cakes cooking when you walk in the door). A week-long stay in a premier vacation home offers access to amenities like hot tubs, private swimming pools, saunas, and outdoor gathering spaces for taking in the sea air, sunrises and sunsets. Surf or Sound Realty has the largest number of oceanfront homes on Hatteras Island and has been providing premier vacation homes for wellness-seeking vacationers since 1978.